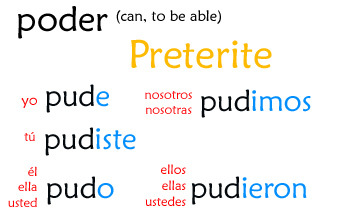 This video covers another irregular verb in the preterite: poder (to be able, can). This verb is most popular with my students in such present tense phrases as ‘¿Puedo ir al baño?‘ (Can I go to the bathroom?) o ‘¿Puedo ir a la fuente de agua?‘ (Can I go to the water fountain?). But of course those aren’t really useful in this video since we’re going over the preterite (a past tense) of poder. Let me know if you have any questions, comments, or suggestions about this video!If you’re having problems with the preterite, why not check out the preterite conjugation sheet? Hi I am really appreciating your work! I took 3 years of spanish in high school and have been getting bu working with Mexicans and visiting latin America for 30 years ,yes I am old. Now I have moved to Costa rica and need to up the bar. I am finding these videos helpful ! My question is when i learned in high school to ask a question ,I was taught to say” tienes tu la pluma. ” I have always done that put the verb then the person after for a question. I notice in your videos you do not .Que pasa con este? Your videos are awesome!!! I really appreciate this resource. I’m broke right now but will definitely donate when I can. The Months of the year + a song! Using De + possessed objects! How to form Adverbs in Spanish! Copyright © 2019 Señor Jordan's Spanish Videos All rights reserved. Theme by Laptop Geek.